Your Italy vacation starts by following a route that connects Italy's must-see sights — from Venice to Lake Como, the Cinque Terre, Florence, Assisi, and Rome. Rick Steves' money-saving My Way vacation package gives you the freedom to decide your own daily sightseeing priorities and pace. We cut the stress by providing comfortable rooms in centrally located hotels, private bus transportation from city to city, and an Italy-savvy tour manager to advise you along the way. This morning we'll say "ciao Venezia" as we meet up with our bus and drive to Lake Como. Along the way, we'll stop to grab lunch before arriving at our final destination — the sleepy Lake Como village of Varenna, where you'll have plenty of time to explore its romantic promenade, tiny harbor, and narrow lanes. Sleep in Varenna (2 nights). Boat: ½ hr. Bus: 5 hrs. All you'll need is a Lake Como ferry boat pass and you'll have the entire day and evening free to explore the villages and waterways of romantic Lake Como, including such elegant stops as Bellagio. Hike up into the Alpine foothills for unforgettable vistas, or take an hour-long train trip to Milan for a day of city sightseeing. No bus today. Today's destination is Italy's Cinque Terre: five perfectly preserved fishing villages, laced together with hiking paths that meander between vineyards and the deep blue sea. We'll arrive late this afternoon, with plenty of time to enjoy the pleasant eateries and ambience of our seaside town. 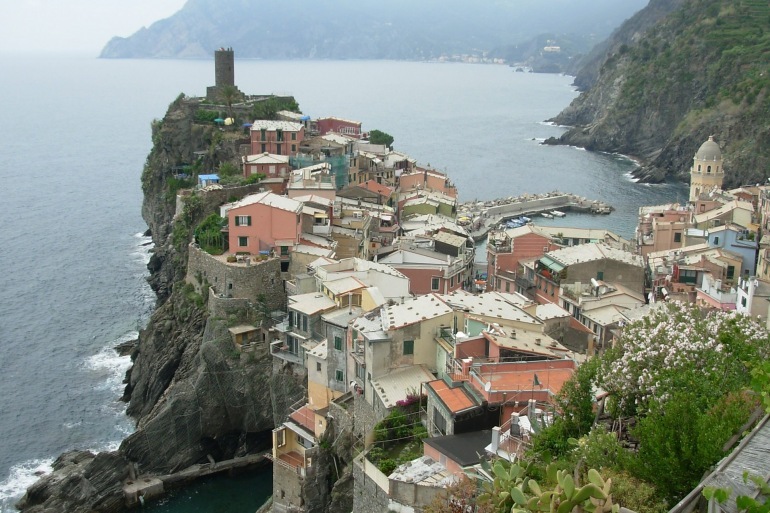 Sleep in or near the Cinque Terre (2 nights). Train: ¼ hr. Bus: 5 hrs. Ahh, it's time to take a "vacation from your vacation" today in our Mediterranean getaway. Pick a Cinque Terre village and spend your day exploring the stairways and alleyways, sunning yourself on the rocks, or sipping a cappuccino and catching up on your journal at an outdoor café. Or, if you're looking for lots of exercise, fresh air, and panoramic views, start your day early and hike the cliff-side paths that connect the towns. For dinner tonight, enjoy what's local and fresh: the seafood and the "best pesto pasta in Italy." No bus today. We'll drive straight to Florence this morning, so you can hit the ground walking. This afternoon is yours to explore the Renaissance city, including Brunelleschi's magnificent cathedral dome*, Ghiberti's Baptistery doors*, and other creations that helped define this world-changing era. You could even take time to visit the Accademia Gallery*(r) and marvel at works of sculptural genius: Michelangelo's rough-hewn Prisoners and his greatest masterpiece, David. Sleep in Florence (2 nights). Train: ¼ hr. Bus: 3 hrs. Today we'll venture into the heart of magical Tuscany, stopping for several hours to poke around the quiet lanes of a friendly hill town. This afternoon we'll make a modern-day pilgrimage to the beautifully preserved hill town of Assisi, the hometown of St. Francis. Sleep in Assisi (2 nights). Bus: 4 hrs. This morning we'll get an early start as we make our way from Assisi to Rome, with a quick stop for lunch along the way. Arriving at our Rome hotel this afternoon, you can enjoy dinner at the outdoor café of your dreams, then celebrate la dolce vita Roman-style, with an after-dinner stroll through the floodlit heart of the city, lacing together the lively campos, classy piazzas, and splashy fountains. Don't forget to taste some refreshing gelato along the way. Sleep in Rome (2 nights). Bus: 3 hrs. When you arrive in Venice, use the Rick Steves Italy guidebook to get oriented. Try out a few words of Italian, and get over your jet lag with lots of fresh air and exercise. Walking tours make a great introduction to any town. Use the free Rick Steves Audio Europe™ app for Apple and Android (or get free podcast/mp3 files) which includes a wealth of Venice neighborhood walks and self-guided museum tours. Check the Rick Steves Italy guidebook for museum hours (some are closed one day per week; some stay open late one day per week). Remember, you will be in charge of your own sightseeing for ALL destinations on this trip, so you should begin planning well before you fly to Italy! To avoid wasting time in long lines, we strongly recommend you make reservations — in advance from home — for the Accademia and Uffizi Galleries in Florence, and the Vatican Museums in Rome. See the Rick Steves Italy guidebook for details on how to reserve.